Milwaukee is great, just ask us. But sometimes you want to head out of town to see the rest of the country. For many destinations, if going by car that means heading through Chicago. That means Chicago traffic, tolls, and time. Since 2004 there has been a more relaxing way to head west, especially if going to or through Michigan: the Lake Express ferry. You can skip all that and have a relaxing ride across the lake to Muskegon, MI. Of course there is a cost to that convenience. It's not cheap, you could fly to Michigan many days depending on the current airfare rates, but then we know you are taking your car for some reason. Luckily there is a great way to reduce the cost. For a few years now, the Lake Express has partnered with Milwaukee Bicycle Collective on a bike donation program on or around Earth Day. In return for a donated bike you get one free round-trip passenger fare. This year the donation event is Thursday, April 20. It takes just only 2 hours to cross the lake on the ferry, per Google Maps it takes 4 hours and 36 minutes to drive to Muskegon. So it saves lots of time, not to mention a lot of headaches. It's especially great for motorcyclists who can ride for a bit cheaper (sometimes the motorcycle is free) and its a lot more comfortable and stress free than the ride through Chicago. Getting a free passenger fare makes it even better. A passenger fare is $153 round trip. A car is an extra $190, a motorcycle is $98 (though often, for 2017 all Spring and Fall crossings, a bike is free). If you donated two bikes you could save over $300, sop check your garage for an old bike that's been sitting there unused. Even if you don't have a bike you could yet find one at a garage sale or if you had to, buy one at a Goodwill (I'm not sure what the going rate is for a bike at GW but it can't be much to offset the free fare). Sure I know that's kind of robbing Peter to pay Paul, but the organization the bikes are going to will make sure they are refurbished, and well-used, becoming a true value to the community. The Milwaukee Bicycle Collective is a volunteer-driven, 501(c)(3) non-profit organization that helps provide individuals, groups, and events with refurbished bicycles. They also assist with bike repair and instruction in a creative and supportive environment and at an affordable cost. 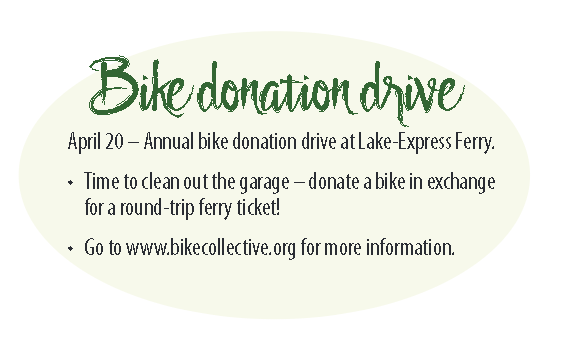 The Lake Express Ferry sponsors the annual bike donation drive and to support it provides one free round-trip ticket per household with each bike donation.. This year it is Thursday, April 20, 8:30 AM – 4:30 PM at Lake-Express Ferry, 2330 S. Lincoln Memorial Drive, Milwaukee.